Great present or gift! 7 M 6-7 yrs 48-51 52-62 23 21 ¼ 21 ½. 5 S 4-5 yrs 42-45 40-44 22 17 ¾ 21. 4 XS 4 yrs 39-42 36-40 21 ½ 16 20 ½. 12 9-10 yrs 58-60 86-98 25 ½-26 26-26 ½ 22. Size 10 -12 year. Gymboree Boys Underwear 3Piece Set. I'm more than happy to work with you. 100% cotton rib. 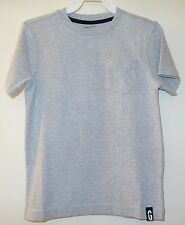 Gymboree boys t-shirt, size 4. White with navy t-rex dinosaurs and navy collar. Beautiful condition! This is a pair of straight fit shorts from Gymboree's Rock The Waves line, adjustable waist, boy's size 7, NWT. Picture may be of a different size. Nwts either sz 2t Boys Gymboree Jurassic World Dinosaur Rashguard and lava swim trunks. Pieced stripe design. 100% Cotton. Half-button placket. NWT Gymboree Boys Graphic Tee Shirt Size 4 5 6 & 7 Selection! The shirt is brown with a globe and plane on the front. It is size 4 and is in very good condition with a little fading/piling. I try to list the best as I possibly can. We do have a non-smoking house, but we do have a cat. NWT BOYS' CLOTHES LOT ~SIZE 6, 5/6~ WINTER/ SPRING L/S SHIRT PANTS HOODIE NEW . Condition is New. Shipped with USPS Priority Mail.